METAFECTENE® PRO is a liposome based transfection reagent consisting of a mixture of polycationic and neutral lipids. It is an advanced product based on METAFECTENE®. Structural changes of the comprising cationic lipids results in higher efficiency and lower toxicity. METAFECTENE® PRO is part of a temporal development series of transfection reagents from Biontex, which includes in particular the following reagents: METAFECTENE® < METAFECTENE® PRO < K2® Transfection System < K4® Transfection System. With the development degree the probability of a successful transfection increases (see also General Selection Aid). Low cytotoxicity and lack of serum inhibition allow for a wide range of applications. 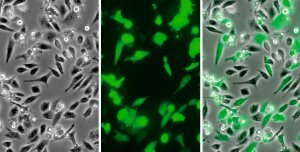 METAFECTENE® PRO is suitable for transient and stable transfection of mammalian cell lines and primary cells with DNA (plasmids, bacmids), RNA (mRNA, miRNA and siRNA) and modified nucleic acids (antisense oligonucleotides). Areas of application are particularly the production of proteins, antibodies, and viruses (e.g. adenoviruses, AAV, lentiviruses), cotransfections of different nucleic acids, genome editing (e.g. CRISPR/Cas9, CRISPR/Cpf1) and gene silencing (gene knockdown). 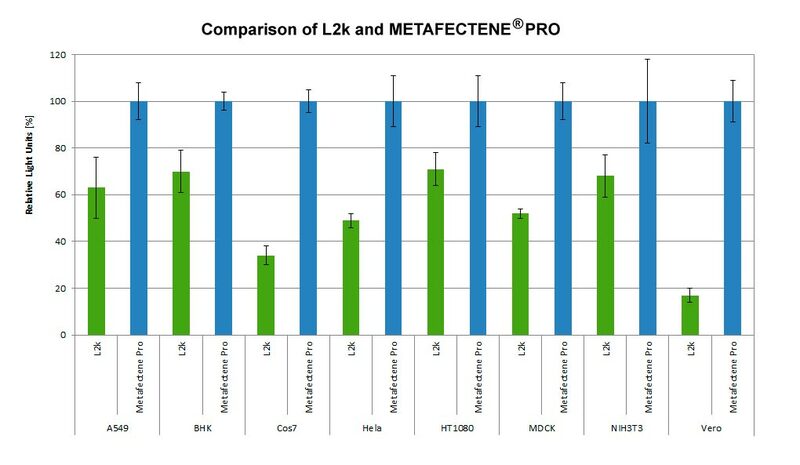 Comparison of METAFECTENE® PRO with another commercial available Transfection reagent (L2K) in an transfection assay with pCMV-Luc under optimized conditions.